Here at Pudgie Revolution, we say that anything you can think of eating tastes better in the form of a pudgie pie. No campfire food is more classic than the s’more, so we decided to develop a s’mores pudgie recipe. Easier said than done. While s’mores are a simple 3-ingredient delight, they don’t translate simply into pudgie pie form. PROBLEM #1: The Crust. There is no pre-made graham cracker crust: no graham bread, no graham dough, and graham crackers are too rigid to work. We tried a brownie crust with graham crackers inside. While that tasted good, it didn’t taste like a s’more. 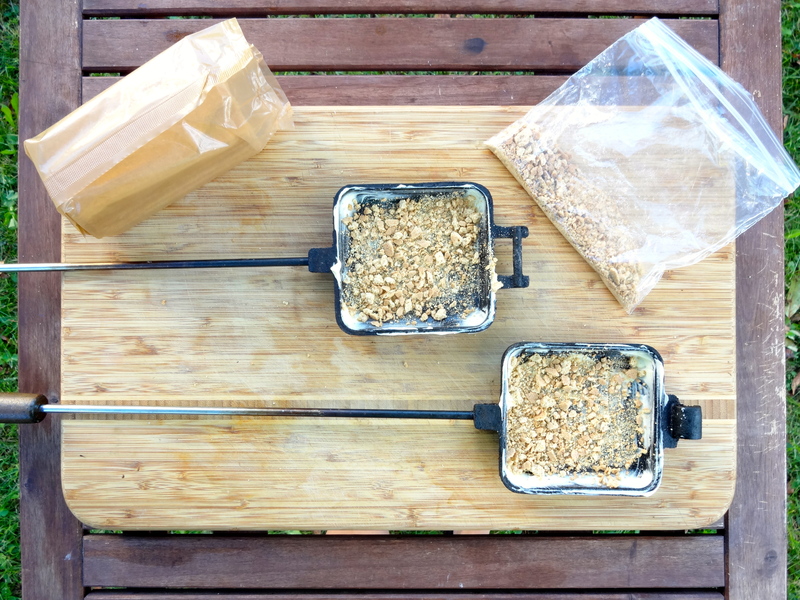 We made a butter, sugar and graham cracker crumb pie crust and pressed it into the pie iron. Never do this. It makes a gigantic burned mess. THE SOLUTION: Put 2 graham crackers in a plastic bag and crush them. 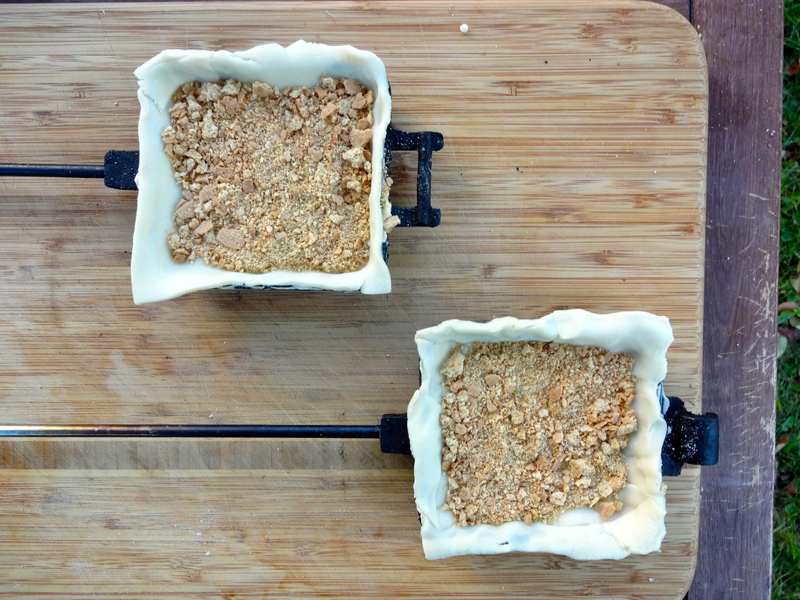 Sprinkle some of the graham crumbs into both sides of a buttered pie iron, top with refrigerated rolled pie crust and gently press down. Top with remaining graham cracker crumbs. PROBLEM #2: The Marshmallow. Marshmallows and pudgie pies don’t mix. Put marshmallows into a dessert pie and they vanish by the time that pudgie is cooked. It’s the case of the mysterious missing marshmallow. Big or small, it doesn’t matter: they melt and disappear. There is no gooey goodness upon biting in, just a sad, hollow pudgie crying out for marshmallows. What about marshmallow fluff? It works better, but it’s fussy: too much and it oozes out, too little and your pudgie is flat and under-filled. In desperation, we searched the Little Debbie section at the grocery store. Ding-Dongs, maybe? Or these Marshmallow Pies? It seemed promising, but both were a flop. We racked our brains for other marshmallowy options. THE SOLUTION: Mallo Cups! Plus a little bit of Fluff. 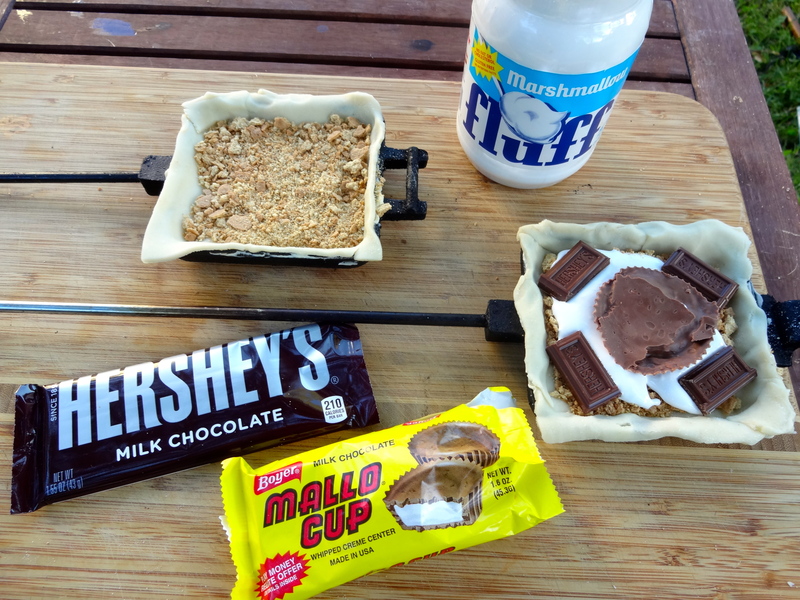 Top your pie dough and crushed graham crackers with about 3 tablespoons of Fluff, 1 Mallo Cup, and 4 squares of milk chocolate in each corner. Toast to perfection over hot coals. It’s s’more delicious than you ever could have imagined! 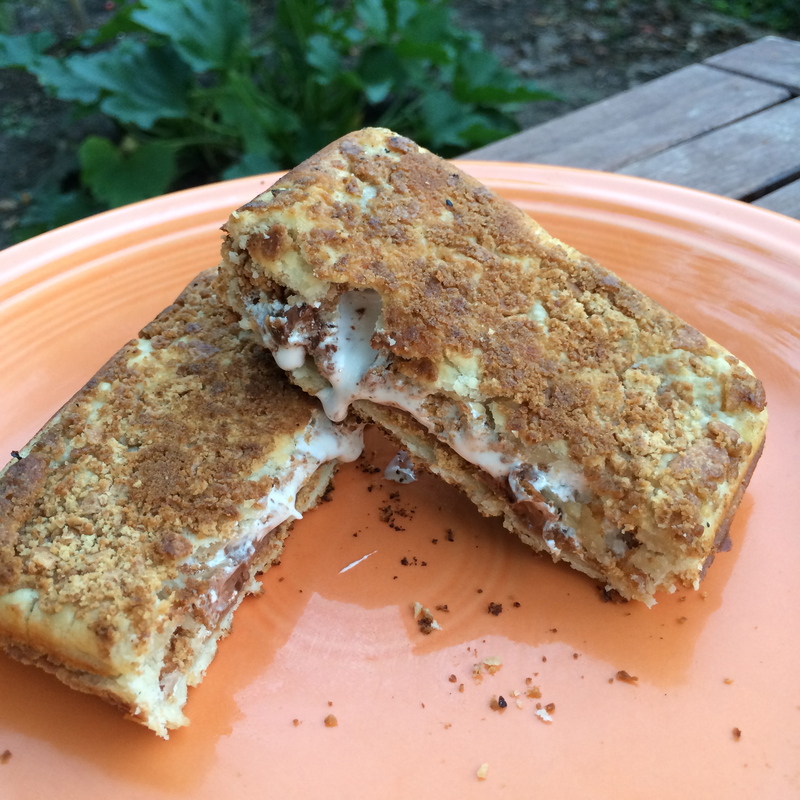 Categories: Recipes | Tags: campfire, campfire pie, camping, cookbook, hobo pie, jaffle, mountain pie, pudgie pie, pudgy pie, recipe, s'mores | Permalink.